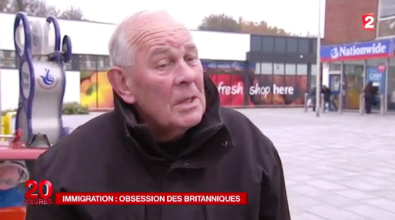 France 2 evening news, 24 November 2014. Remember when they wanted to change the recipe of Coca Cola? Very bad idea. If there’s one golden rule in marketing, it’s not to mess around with well-established household brands. You may surprise the customer with brand extensions – diet coke, cherry coke, coke zero – but you never ever alienate him from the core of the brand. Nation brands are just as precious. Their main asset is consistency over time. There may be some negative stereotypes around, there may be some sporadic unpleasant phenomena, but there are some strong positive connotations that will never change. What the British (both government and citizens) do not seem to realise is that they have allowed UKIP, with all its rhetoric of ‘defending’ the UK’s national interest, to start damaging the core of the national brand. Not through their hatred of the EU – within Europe, Euroscepticism is a widely shared and perfectly legitimate attitude; outside of Europe, the EU is poorly understood anyway. It’s the obsession with immigration – imposed by UKIP on the British public debate and nurtured despite better knowledge by a particularly spineless government – that will become a reputation disaster for the UK. Four representative of mainstream middle-class, definitely not impoverished proletarians in need of a scapegoat. What the report did not even clearly explain is that the immigration these people are so concerned about is not the huddled masses from what used to be called ‘third-world countries’, but citizens from European member-states. As numerous image surveys have shown, Britain has always been considered worldwide as a tolerant, open, multicultural society. In the global Anholt-GfK Nation Brands Index the UK has always figured among the top countries. If this outright xenophobic discourse, which seems to take hold of the British public debate and which is likely to sound even shriller and more paranoid during the forthcoming election campaign, is perceived elsewhere as representative of British public opinion, the harm done to the precious UK brand image will be considerable (much more so than Scottish independence would have been). Precisely because it will be no longer perceived as the antics of a political fringe group, but as a change in fundamental society values. Leaving the EU is one thing. That’s just packaging. Changing the basic recipe is another one. This entry was posted in Current Affairs, Democracy & Citizenship, Global & International, Society & Culture. Bookmark the permalink. Part of understanding this is that groups such as UKIP will pursue this strategy of linking EU membership and immigration precisely because it gets them more leverage over leaving: the collateral damage is just that, collateral. The problem is that is makes any post-membership settlement all the more difficult.